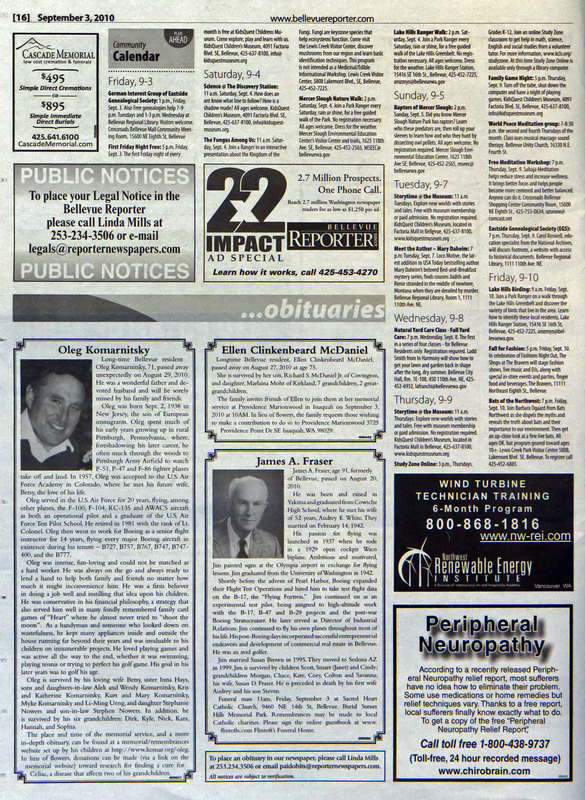 Here is the obituary for Oleg R. Komarnitsky that ran in the Bellevue Reporter on September 3rd, 2010. For more information about Oleg's life (and to leave a comment), please see the Oleg Komarnitsky Memorial/Remembrances page. Long-time Bellevue resident Oleg R. Komarnitsky, 71, passed away unexpectedly on Aug. 29, 2010. He was a wonderful father and devoted husband and will be sorely missed by his family and friends. Oleg was born Sept. 2, 1938 in New Jersey, the son of European immigrants. Oleg spent much of his early years growing up in rural Pittsburgh, Pennsylvania, where, foreshadowing his later career, he often snuck through the woods to Pittsburgh Army Airfield to watch P-51, P-47 and F-86 fighter planes take off and land. In 1957, Oleg was accepted to the U.S. Air Force Academy in Colorado, where he met his future wife, Betsy, the love of his life. Oleg served in the U.S. Air Force for 20 years, flying, among other planes, the F-100, F-104, KC-135 and AWACS aircraft as both an operational pilot and a graduate of the U.S. Air Force Test Pilot School. He retired in 1981 with the rank of Lt. Colonel. Oleg then went to work for Boeing as a senior flight instructor for 14 years, flying every major Boeing aircraft in existence during his tenure - B727, B757, B767, B747, B747-400, and the B777. Oleg was intense, fun-loving and could not be matched as a hard worker. He was always on the go and always ready to lend a hand to help both family and friends no matter how much it might inconvenience him. He was a firm believer in doing a job well and instilling that idea upon his children. He was conservative in his financial philosophy, a strategy that also served him well in many fondly remembered family card games of "Hearts" where he almost never tried to "shoot the moon". As a handyman and someone who looked down on wastefulness, he kept many appliances inside and outside the house running far beyond their years and was invaluable to his children on innumerable projects. He loved playing games and was active all the way to the end, whether it was swimming, playing tennis or trying to perfect his golf game. His goal in his later years was to golf his age. He is survived by his loving wife Betsy, sister Inna Hays, sons and daughter-in-laws Alek and Wendy Komarnitsky, Kris and Katherine Komarnitsky, Kurt and Mary Komarnitsky, Myke Komarnitsky and Li-Ming Ueng, and daughter Stephanie Nowers and son-in-law Stephen Nowers. In addition, he is survived by his six grandchildren: Dirk, Kyle, Nick, Kara, Hannah, and Sophia. 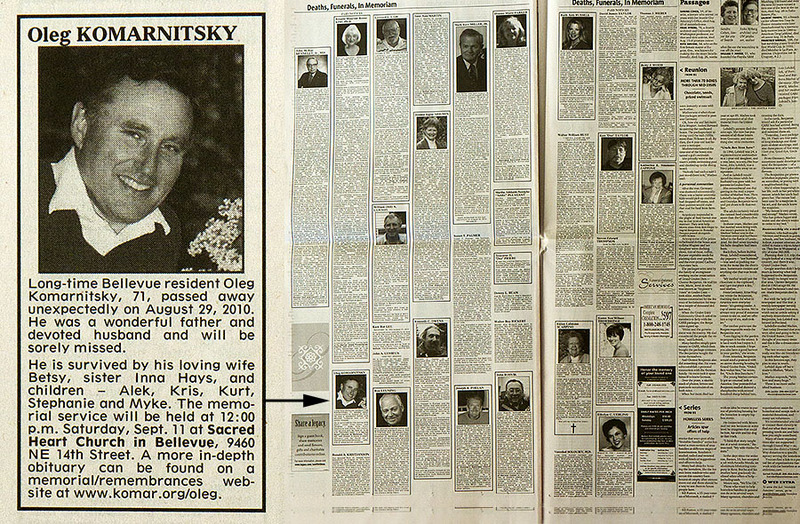 The place and time of the memorial service, and a more in-depth obituary, can be found at a memorial/remembrances website set up by his children at http://www.komar.org/oleg/. In lieu of flowers, donations can be made (via a link on the memorial website) toward research for finding a cure for Celiac, a disease that affects two of his grandchildren. The memorial service was held on Saturday, September 11, 2010 at Sacred Heart Church, Bellevue, Washington.